Hemel Hempstead Town FC have continued to build their squad ahead of the 2015/16 National League South campaign with the capture of two exciting young forwards. The Tudors have signed Rheo Josephs from Ware, as well as highly-rated Ivorian Willy Gnahore following his release by Championship side Nottingham Forest. Both of these players give us a different dimension to what we have already got at the club. The duo add to Hemel’s plethora of attacking talent, following the capture of proven goalscorers John Frendo and Jamie Slabber, as well as the emergence of Oliver Hawkins as a top centre-forward last season. 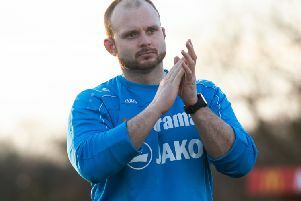 Tudors manager Dean Brennan said: “We have managed to sign young Rheo Josephs, who was playing at Ware last year – he’s an out-and-out left winger. “He’s got fantastic pace and scores goals – he’s somebody who we scouted and we like him a lot. He’s been excellent in pre-season. “We have also signed a kid called Willy Gnahore who was released by Nottingham Forest. He’s an Ivory Coast youth international centre-forward. “Willy is a completely different type of player in the sense that he makes things happen. He is a real number 10 who is very creative and can score goals. He’s got real pedigree so we will see if he can do the business for us. “Both of these players give us a different dimension to what we have already got at the club. The Tudors have shown encouraging signs in pre-season, and Brennan is pleased with his business over the summer. “The signs are good; it’s good that the centre-forwards are scoring and we are just really looking forward to getting going,” he said.